I had a chance to look at the brochures, floorplans and pricing on this. Overall, looks like they are staying with the wrap around balconies from Casa. The floorplans, as per the trend around the city, are smaller than those in Casa. VIP pricing looks to be around $700 sq. ft. There is only one 1+1 unit, with a higher number of 2 bedroom units than you would expect. But they are not big units, and the second bedroom can be quite small like a den. I wasn't crazy about the floorplans....these smaller units make it tough to fit your furniture in. The podium is very small at only 2 storys for such a high building, so it won't have the spectacular concierge area that some do, especially Casa. The brochure advertises an outdoor pool, so i assume that would be on the south side fronting Charles st. Overall, the building will look nice from the outside. I really think we will start to see a shift from one bedroom to two bedrooms for investors. Individuals are being priced out of one bedrooms, and are pooling their resources and renting two bedrooms with a roomate. One bedrooms rent for at least 1500-1600 in that neighbourhood, where as 2 bedrooms rent for 2400-2500. I am a huge fan of the original so I am glad to see this one the way it is. The price for one bdrm units is actually in the $750-$760 range, I am not sure may be 2bdrms are better priced. At this rate resale in Casa 1 looks as a more appealing investment. I am just not sure what is the incentive to purchase an investment property which is priced higher than a current resale in a comparable building and location. Although may be Cresford would do what Chaz did:to start with higher prices, and then lower them? This went up today over the the 1000 Bay presentation centre. Seems to be an odd place for it but this presentation centre might be selling both. The X2 and Casa 2's and 3's must be making a killing... extremely high FSRs, recycling the same design, yet still charging $700+psf. It's all in the marketing. 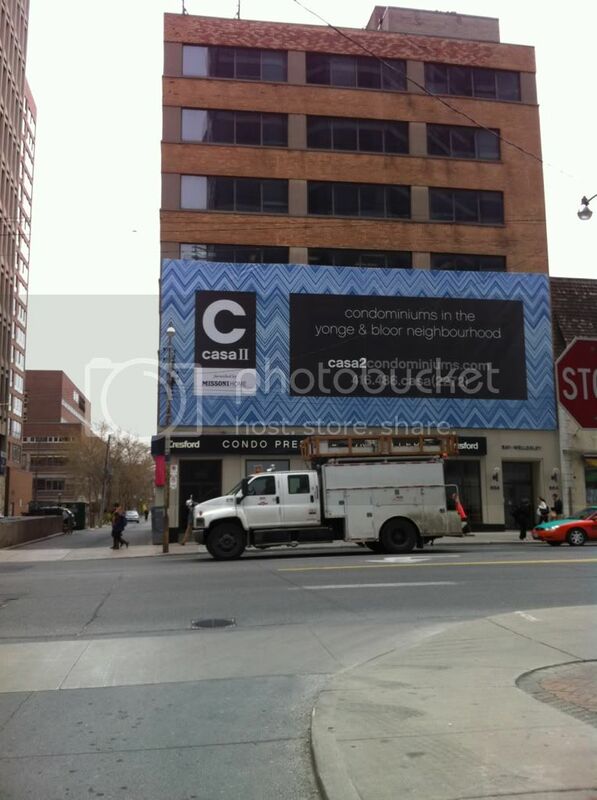 I went to the Chaz Sales Center about 4+ years ago and they were saying that the building is in Yorkville. So, they are charging yorkville pricing. X2 is extemely overpriced IMO, but people are buying so... what do I know? It's insane. I'm currently living in a bachelor in a Greenrock highrise a few blocks south... no granite countertops, but I have 350sf, 18 feet of window, and a large balcony looking south into a large fountain and park with trees, with no shadowing over my unit even during winter (and none of the buildings south of me are being torn down anytime soon). I'm paying $950/mo, which won't even cover the maintenance fees and mortgage interest on an equivalent studio with little natural light at any of the projects along Charles or Hayden. It makes no sense to buy right now. Yup. I just don't think it will get any easier.